You can find a lot of information and advice about workplace bullying on the internet. Unfortunately while most of the information and advice is good so far as it goes, I find that much of it nonetheless misconstrues the nature of the problem. Document what is happening – keep a record of the harassment as it occurs, with names of witnesses if applicable. Reach out and let someone know what is happening. Contact a union rep, or the Human Resources Dept, or the Employee Assistance Dept. If possible, try not to be alone with the bully. As one-size-fits-all advice, this is pretty good. The problem is that the focus is on individuals – bullies and their victims – rather than on the workplace culture that makes both kinds of roles possible. 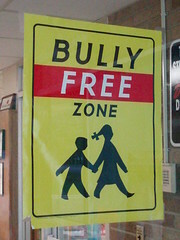 Bullying is problem of organizational structure or culture; it requires management-level intervention and solutions. Expecting the victims of bullying to solve their own problems is both unrealistic and an abdication of management’s responsibilities. How management approaches the problem can make the difference between a flourishing and respectful workplace, and a workplace with low morale, low productivity, high employee turnover and a host of other problems. I was once called in to a workplace where Mike, a recent hire (and not his real name) was persistently harassed by his immediate supervisor. The supervisor insulted his work, made a big deal out of minor mistakes, denied him information that was necessary for completing work properly, and generally treated him horribly. Mike liked the actual work and seemed to be pretty good at it, but things got to the point where he dreaded having to show up in the morning and had to take an unpaid stress leave. Luckily for Mike, he had the support of his co-workers who could see the supervisor’s bullying behaviour for what it was. Mike wasn’t so fortunate when he approached management about the problem. The manager and the supervisor had a history together that Mike and the manager did not. The manager assumed that the supervisor’s behaviour was justified, that Mike was a “hot head” who didn’t know the job yet and couldn’t take constructive criticism. You can imagine the messages sent by the manager’s failure to investigate properly. The bully got the message, “Your behaviour is just fine and there is no need to change.” Mike got the message that he was not valued in the organization. And his co-workers got the message that, if they were in a similar situation, management would not support them. It is unfortunate but hardly surprising that things got worse for Mike before they got better. Eventually, it took all of Mike’s co-workers in the department together going to the manager to let him know what they’d seen. And I have to give credit where it is due: When the manager understood the reality of the situation, he made it clear to the supervisor that the bullying behaviour could not continue. When the supervisor received that message, clearly and in no uncertain terms, his behaviour changed. The lessons for managers: Bullying is a problem of workplace culture; it is not a problem that you should expect employees to solve between themselves. Everyone, at every level of the organization, needs to know what kind of behaviour is unacceptable. And when someone crosses the line of acceptable behaviour, management needs to be willing to back up their words with action.